What is Shed Terminator Chews For Dogs? 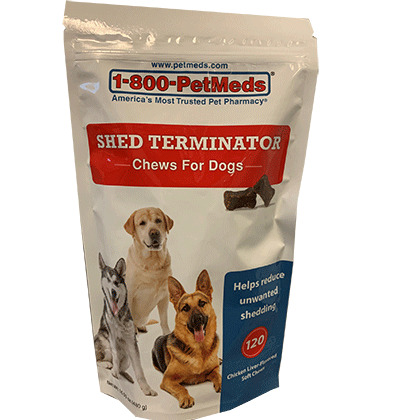 1-800-PetMeds Shed Terminator Chews for Dogs is shed control in a yummy, convenient chew. Excessive shedding can be unhealthy, cause discomfort, and lead to skin problems. Shed Terminator is a unique blend of vitamins and minerals that helps to reduce or eliminate unnatural or unwanted shedding, and restore your pet's vibrant coat. Made in the USA. Each chew contains a special blend of natural oils, herbs, minerals, antioxidants, and vitamins that can effectively reduce unwanted shedding in dogs while providing a healthier and shinier coat. Shed Terminator Chews for Dogs may cause gastrointestinal upset. Shed Terminator Chews for Dogs; Omega 3 fatty acids. 1-800-PetMeds Shed Terminator Chews for Dogs used to help reduce unwanted shedding produces a radiant coat and promotes healthy skin in dogs. 1-800-PetMeds Shed Terminator Chews for Dogs is a non-prescription (OTC) product available as natural chicken-liver flavored chew. The usual dose for dogs up to 25 lbs is 1 chew in the morning and 1 chews in the evening, for dogs 25-60 lbs give 2 chews in the morning and 2 in the evening, and for dogs over 60 lbs give 3 chews in the morning and 3 in the evening. Side effects that can occur with 1-800-PetMeds Shed Terminator Chews for Dogs can include gastrointestinal upset. This product is for animal use in dogs only. To prevent gastrointestinal upset, gradually introduce 1-800-PetMeds Shed Terminator Chews for Dogs to your dog's diet over a 15-day period. 1-800-PetMeds Shed Terminator Chews for Dogs should not be given to cats. 1-800-PetMeds Shed Terminator Chews for Dogs is a natural chicken-liver flavored chew. Other Ingredients: Oat flour, rye flour, glycerin, natural chicken liver flavor, brewers dried yeast, flaxseed meal, arabic gum, canola oil, water, soy lecithin, maltodextrin, sodium alginate, calcium sulfate, citrus pectin, fish oil concentrate, sorbic acid (a preservative), manganese proteinate, zinc proteinate, copper proteinate, choline chloride, propionic acid (a preservative), mixed tocopherols (a preservative), niacinamide, inositol, vitamin B12 supplement, vitamin A supplement, thiamine mononitrate, pyridoxine hydrochloride, riboflavin, vitamin D3 supplement, selenium yeast.